Trump says solar tariff will create ‘a lot of jobs.’ But it could wipe out many more. The tariff sparked controversy in the solar industry after Trump imposed it Jan. 23. A couple of remaining U.S. solar-cell manufacturers say it will help them get back on their feet. But the developers that install solar panels and farms — a much larger segment of the industry — say it will hike their costs, kill projects and make it harder to compete with wind and natural gas. But the tariff is bound to change the dynamics. Will it add “a lot of jobs,” as Trump says? Relying on a little-used section of trade law that lets him “safeguard” U.S. products being hammered by imports, Trump imposed a tariff on solar cells and modules that starts at 30 percent in 2018. The tariff then drops to 25 percent in 2019; 20 percent in 2020; and 15 percent in its final year, 2021. The first 2.5 gigawatts of imported solar cells are exempt from the tariff each year. “This 2016 growth has been driven primarily by a massive increase in solar energy installations,” the census report says. Unlike U.S. solar-cell manufacturers — which have struggled to stay afloat — the developers who install solar panels for homes, businesses, municipalities and utilities have been reaping the benefits of a steep, years-long decline in prices for solar cells imported from low-wage countries. These developers say that in a competitive U.S. energy market, the lower price and higher quality of imported solar cells give them an edge against wind and natural gas suppliers. The Solar Energy Industries Association, a national trade group, also opposed a tariff in ITC testimony and estimated that 23,000 jobs would be lost in 2018 because of Trump’s move. The thinking goes like this: Because the tariff will raise the cost of importing solar cells, and few if any U.S. cell-makers can meet the manufacturing volume or technical specs for large-scale projects, solar developers will not be as competitive — and in many cases buyers will choose another energy source. Every lost project means many fewer jobs, since solar panel arrays are fragile and complex and require many different kinds of workers to install. Independent analysts at GTM Research estimated that Trump’s tariff would cause an 11 percent decline in the amount of solar power capacity expected to be installed in the United States over five years, from 2018 to 2022. GTM analysts say the tariff will slow but not stop the growth in the solar industry. Camron Barati, an analyst at IHS Markit, another research firm, said the decline would be 9 percent to 10 percent over the tariff’s four-year lifespan — a drop from 62 gigawatts in new solar capacity to 56 gigawatts from 2018 to 2021. “Any increase in price in the future will negatively impact how much solar is installed in the United States, as well as the companies and people that rely on access to competitively priced solar equipment for their livelihood,” Amy Grace, an analyst at Bloomberg New Energy Finance, testified before the ITC. Here’s how the Solar Energy Industries Association arrived at its 23,000 figure for net job losses in 2018. The trade group said it took a previous study by IHS Markit on the potential effect of several different tariff rates and adjusted its figures to reflect Trump’s final numbers. The National Renewable Energy Lab has developed a model for estimating how many jobs would be needed for solar installation projects. The Solar Energy Industries Association ran its numbers through that model to estimate how many jobs would be needed in total after accounting for the lower number of solar installations. With that in mind, our next question was whether the tariff could start a boom in solar-cell manufacturing. After all, that’s the part of the industry Trump is trying to help. And if his plan works, that could offset the losses on the installation and maintenance side of the industry. A spokesman for SolarWorld, one of two manufacturers that requested protection from imports at the International Trade Commission, said that after the ITC decided in its favor in September, the company began to hire what will be 200 U.S.-based workers by the end of 2018. Weeks before the tariff was announced, an unidentified foreign company reportedly reached out to city officials in Jacksonville, Fla., with plans to build a solar-module assembly plant that would employ 800 to 1,000 workers. For what it’s worth, the SEIA says that, by factoring in both employment gains and losses from Trump’s tariff, manufacturing jobs overall in the solar industry would decline by 800 in 2018. That’s part of their analysis estimating a 23,000 net job loss in 2018. It’s important to note that even with the tariffs, analysts say low-wage countries such as China, Malaysia and South Korea are likely to keep dominating the global market for solar-cell manufacturing. Several U.S. developers for large-scale solar projects testified before the ITC that in their experience, Suniva and SolarWorld did not meet volume demand, delivery targets or product specifications. There’s one more question: Who really wins with the tariff? Although both have U.S. operations, Suniva is Chinese-owned and SolarWorld is a German company. Bloomberg News reported that the biggest winners from the tariff could be “a group of investment houses around the globe”: Centerbridge Partners, JPMorgan Chase, SQN Capital Management, Marathon Asset Management and Bank of America’s Merrill Lynch International. They are all creditors of Suniva or SolarWorld and stand to benefit if either company is sold or liquidated or if the United States manages to settle several global trade disputes in their favor. In this case, Trump says U.S.-based manufacturers will add “a lot of jobs” because of a tariff he imposed on imported solar cells and modules. The homegrown industry for these products has been decimated by competitors in low-wage countries over the past decade, but there’s no anecdotal evidence or research that indicates Trump’s tariff will bring about an American renewal. Instead, independent analysts, solar industry leaders and the industry’s national trade association say the tariff will price solar installation companies out of the game in places where their projects could be competing with wind or natural gas. The Solar Energy Industries Association estimated that 23,000 net jobs would be lost in the first year of Trump’s tariff, and tens of thousands more in the following three years before it expires. We will be interested to see the tariff’s ultimate effect on the U.S. economy. But for now, a weighing of the evidence on both sides of this debate shows that Trump paints a partial picture. Some manufacturing jobs could be created by the tariff, but many more jobs could be wiped out in the fastest-growing sector of the solar industry. 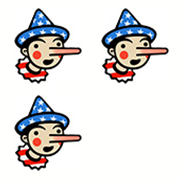 For this, we give the president Three Pinocchios. "We’ll be making solar products now much more so in the United States. … A lot of workers; a lot of jobs."